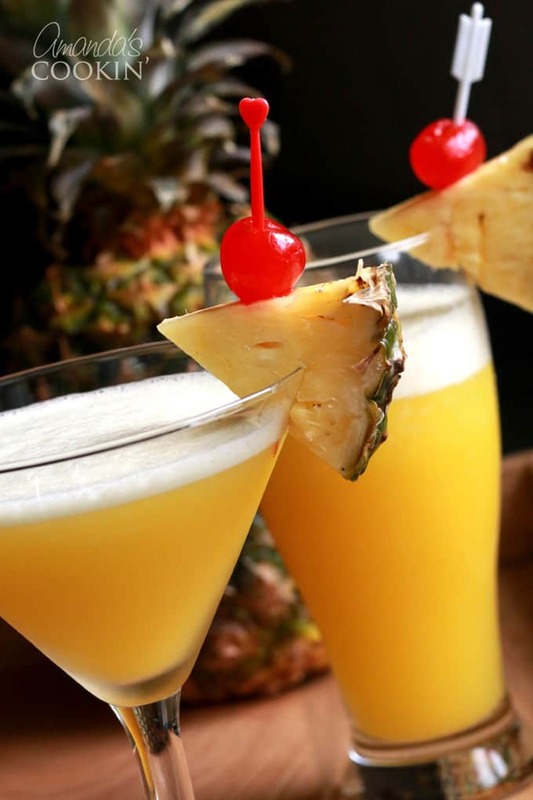 The Rum Cruiser Cocktail is a delicious blend of coconut rum, amber rum, banana liqueur, pineapple juice and orange juice. It’s similar to a Rum Runner, but without the blackberry liqueur and grenadine. You can shake it up martini-style or blend it with ice for an amazing frozen cocktail. No matter how you serve it, a Rum Cruiser is perfect for pool parties and backyard entertaining and is sure to become your new favorite mixed drink for summer. This Rum Cruiser Cocktail was inspired by the incredible cruise we recently took to Alaska courtesy of Princess Cruises, but all opinions are my own. I’m on a cocktail-making kick here at my house this summer, and I owe it all to Princess Cruises . Since returning from the incredible 7-day Alaskan cruise that Amanda and I were on together this spring, I’ve become obsessed with making cocktails! I’ve also made this amazing Espresso Creme Brulee recipe and this Key Lime Pie Martini based off of the amazing drinks on this cruise! I’ve always been a red wine gal, so every night onboard the ship, that’s what I would order when we’d meet for a pre-dinner drink at The Wheelhouse Bar. On our final night of the cruise, I couldn’t help but notice all the gorgeous cocktails that everyone was sipping, so I decided to order one. It was out of this world, and I decided to recreate it when I got back home. Since then, creating yummy cocktails has become a new hobby for me. They’re so fun to make and so yummy! The Key Lime Pie Martini that was the cocktail that started it all. 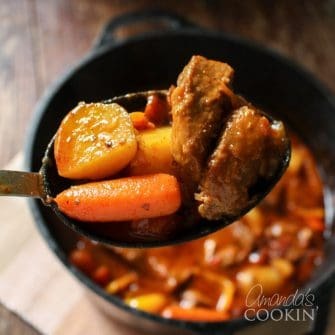 After having a couple that night on the cruise, I knew I had to recreate the recipe back at home, so experimented for several days until I got it just right. Perfecting that cocktail opened up this whole new world to me – the wonderful world of cocktail-making. How on earth have I not delved into it before now? After perfecting the key lime martini, my husband said to me “So, what drink are you going to focus on getting right next week?”. I thought “Hey… What a great idea! Let’s do a ‘drink of the week’ here this summer”. 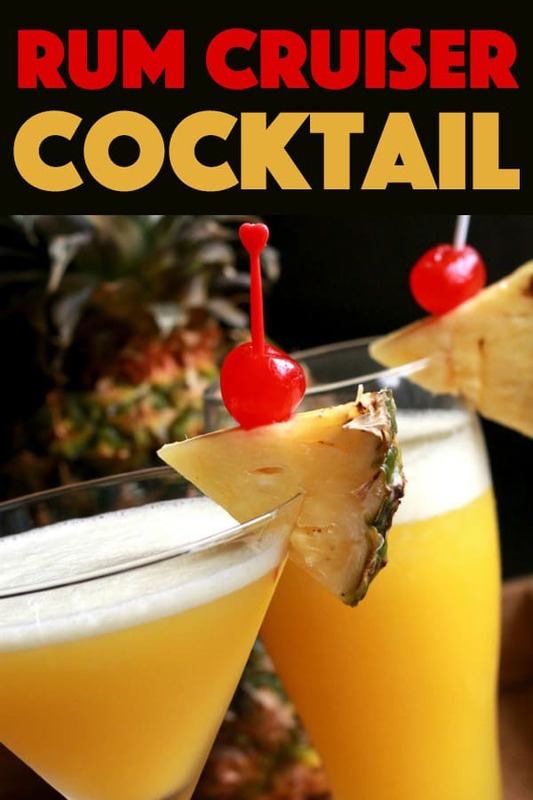 So now, every week, I choose a different cocktail recipe to focus on and I work on getting the recipe just right, using my husband, friends, and family as guinea pigs. My blender is working overtime these days, but no one’s complaining. It’s been so fun! I’ve experimented with lots of different liquors and liqueurs, and I’ve cranked out some mighty fine drinks. So far, this Rum Cruiser Cocktail is our absolute favorite. I created this particular beverage for my husband because a Rum Runner is his favorite cocktail when we’re vacationing. My Rum Cruiser doesn’t contain grenadine or blackberry but without question, it’s just as delicious as a Rum Runner. Maybe even better. I can’t drink it slowly. It’s way too yummy! And it’s super-easy to make. So, what’s in a Rum Cruiser Cocktail? Well, banana liqueur, coconut rum and pineapple juice to start. What’s not to love, right? Isn’t that how all the best cocktails start? Add a little amber rum and a little orange juice, and you have perfection in a glass. The first few times I made this cocktail, I made it like a martini, shaking it with ice and serving it up in a martini glass. When our summer heat wave arrived, I decided to try making the Rum Cruiser as a frozen cocktail, throwing all the ingredients in a blender with a couple of handfuls of ice. The results were beyond delicious and so refreshing for summer. 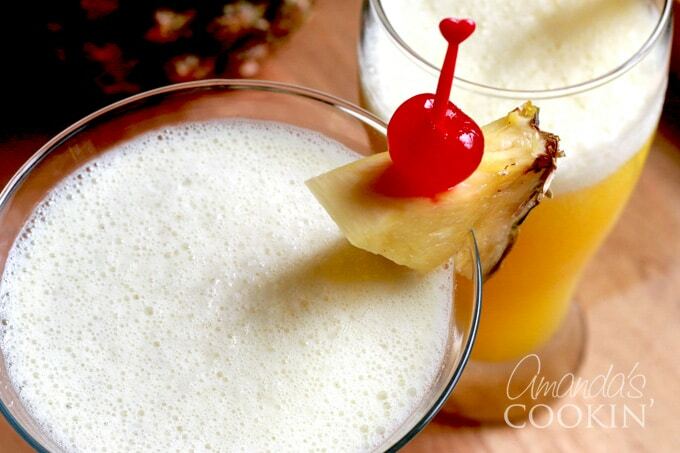 If you’re looking for a delicious frozen drink to serve at your next pool party or backyard BBQ, you have to try my Rum Cruiser Cocktail recipe. I can pretty much guarantee it will become your new favorite drink for summer. banana liqueur – Also known as Creme de Banana (or Banane) it’s commonly used in tropical drinks. Ever tried muddling a banana?? coconut rum – There are several types of rum, coconut rum is usually clear and can be easily found at any liquor store. light or amber rum – Depending on where you live, amber rum is also called gold rum. 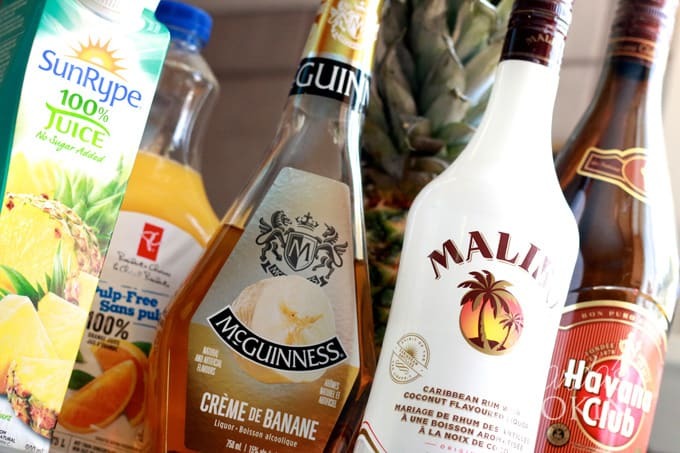 pineapple juice – Because this is a mixed drink, we suggest buying canned pineapple juice. Unless you happen to have a pineapple lying around. Just sayin’. orange juice – You can squeeze your own if you like, but that takes time. Instead, buy the no-pulp bottle at the grocery store. ice – You’ll need this whether you are making a martini (for shaking) or a slushie (for the blender). 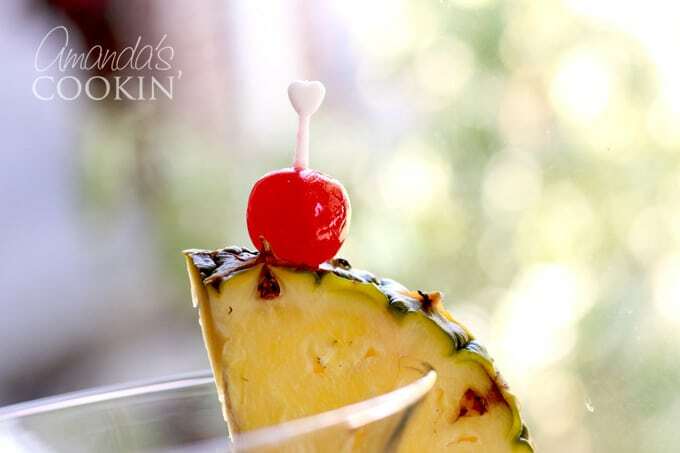 pineapple wedge and a maraschino cherry – It’s just so pretty! Don’t skip the garnish! What’s a cocktail without a pretty garnish? Before preparing your Rum Cruiser, prepare your garnishes so you can simply pour and serve your ice cold drinks as soon as they’re blended. I made a simple garnish by skewering a maraschino cherry and a piece of fresh pineapple together with a cocktail toothpick. 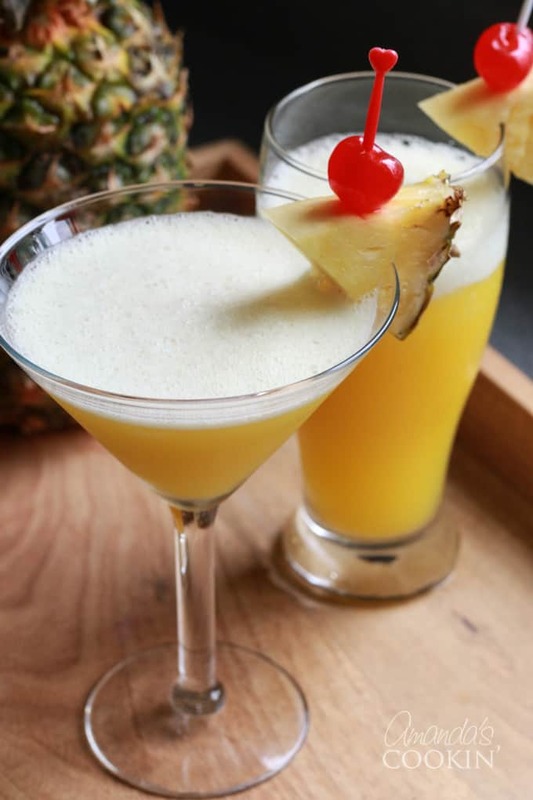 A small slice in the pineapple makes it easy to wedge the garnish to the rim of your glass. Making the cocktail itself couldn’t be any easier! 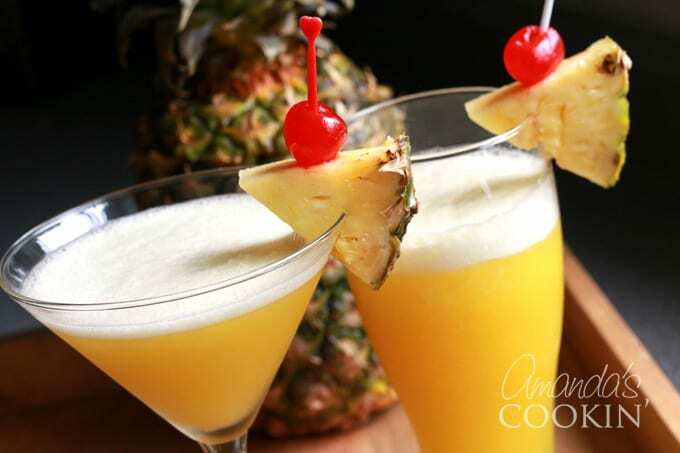 Combine the coconut rum, regular rum, banana liqueur, pineapple juice and orange juice in a blender. I use a Ninja Master Prep blender for this because the blades are amazing for crushing ice. Bonus, the Ninja Master Prep is really affordable and can be used for all kinds of job around the kitchen such as pureeing soup, chopping vegetables, blending smoothies etc. Next, just add your ice, and blend it all together. You can experiment with different blending times. 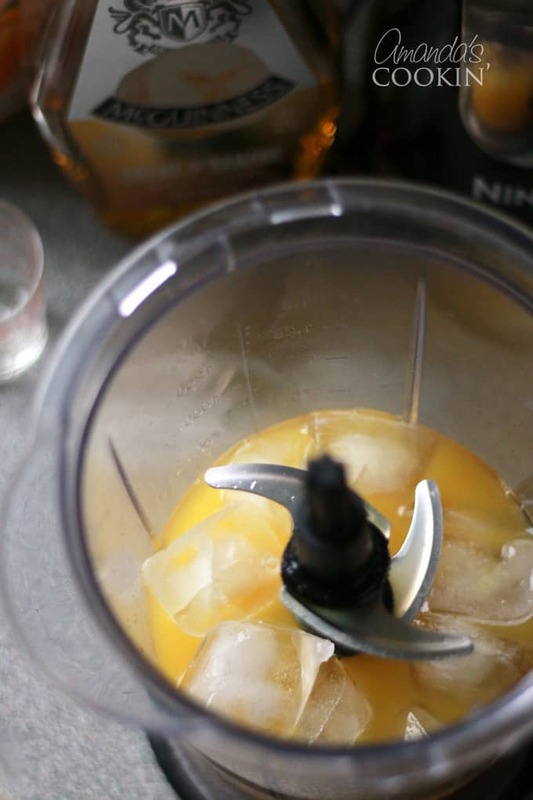 If you want your cocktail to be slushy, blend briefly, pulsing until the ice is just crushed. Want it smoother? Blend it longer. Alternatively, if you prefer a martini-style cocktail, just pop your ingredients into a martini shaker, add a few ice cubes and shake for 30 seconds until your drink is thoroughly chilled. Strain and serve. want to know more about our amazing Alaskan Cruise? We went Whale Watching in Iy Strait Point, went on an exhilarating Mendenhall Glacier Helicopter Tour, and also did the Davidson Glacier Canoe Tour which I’ll be sharing next week! 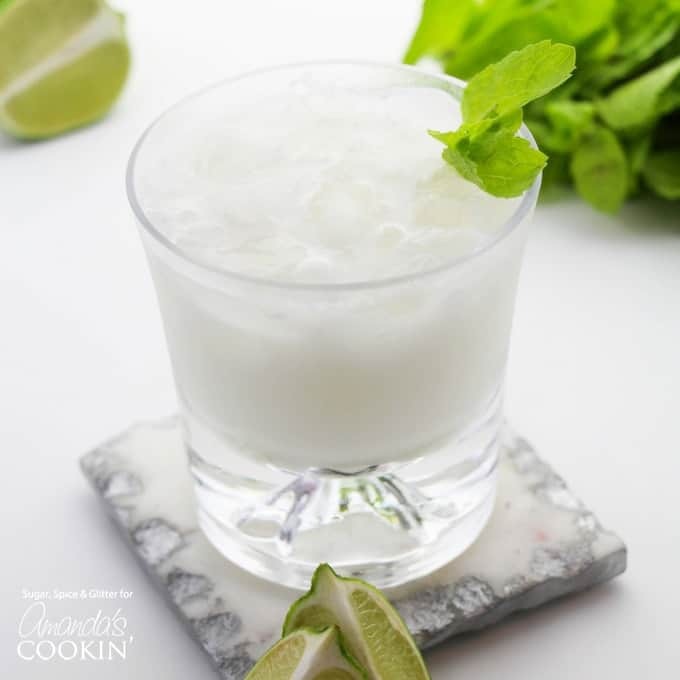 If you’re a rum fan- don’t miss our Coconut Rum Mojito recipe for a refreshing rum cocktail this summer! Owner & Creator at Happy Hooligans Inc.
Jackie Currie is a mom, wife, home daycare provider, and the creative spirit behind Happy Hooligans. She specializes in kids' crafts and activities, easy family recipes and parenting. So fruity and perfect for cruising! 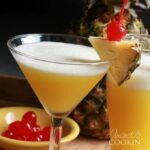 I always love a rum cocktail! This “drink of the week” has actually become “drink of the day” here. It’s SO GOOD! Oh man, wish we were neighbors! Wow looks amazing! We need to make these for our next backyard bbq! This drink is soooo dangerous, LOL. Yum! This looks like such a fun, spirited cocktail. Definitely one to try! Princess Cruises sound amazing! These cocktails are too!! Such a great drink for a summer party. Wow this looks so good. Thanks for sharing.